At CallingPost, we want our blog to be the best resource for you to find way to make your life more organized. Using CallingPost is a great way to begin, by keeping people connected in their church, sports, neighborhoods, classrooms, civic clubs and much, much more. Even better – CallingPost offers a full communication suite of calls, texts, emails, websites, your own PBX phone assistant, event manager and many more features. Start with a Free 15 Credit Trial today and see how CallingPost can help your Yard Sale be better than ever. If you are ready to make your Yard Sale a big time event, you can sign up for a Monthly Plan and feel assured because CallingPost offers a 100% guarantee for its first month. What are you waiting for? We’ve scoured the web to bring you the best resources to make a little cash off of your spring cleaning! 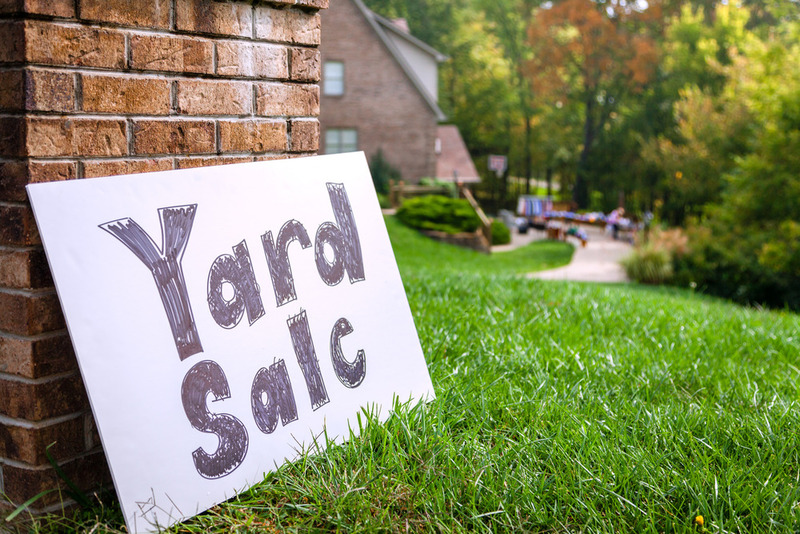 Everyone knows when it comes to yard sales, bigger is better, so getting everyone together for a “multi-family” or “neighborhood” yard sale will get the shoppers running to you with their money in hand! (of course we were going to say that!) CallingPost is a Communications Company, right? So, we think Communication is key, but then again, we do have 20 years of experience and have seen it work! So, get a CallingPost website – set it up in a couple of minutes – then send the link out via every medium you can! Facebook, Twitter, LinkedIn, then Email your church, friends, neighborhood association and more. Even better? Put pictures of your key items up on the page and allow people to message you through your CallingPost account about those items. You’ve generated interest and made your sale a priority in the buyer’s day (and they’ve probably told their friends, too). ETSY also has a great resource for some downloadable signs ($5 for a download, but you can reprint forever and ever). The “all items in here are FREE” sign is my favorite because sometimes you just want the stuff GONE! Click HERE for these signs. Need more tips on Yard Sale Signs and more ideas? This site explains it better than I ever could – Click HERE for the site. Of course, you have your yard sale where you can, but if you have a choice between a windy road in the country and in the heart of a busy neighborhood – we all know where you should have it! Check Out this Guide for picking the best location – if your home is not an option. For an average sale, two rolls of quarters, a $50 in $1 bills, 10 $5 bills, and 5 $10 bills are recommended and don’t put it off until the last minute. Go to your bank, not a store, they may not be able to help you and then you’re stuck! Don’t forget a cash box or even a fanny pack….if you are brave enough to be a 90’s fashion icon. Do you like to bend over and dig through things on someone’s lawn or driveway? Well, neither do your customers. So, get plenty of tables to show off your items. Plus, it shows you care about your items you are selling & that you have taken care of everything, too. Hang up clothes, put kids toys together, books in a single place (and dust off the old ones!) Have a cord out and ready so people can test anything electronic. Also, you know those people that drive slowly by an check out your stuff before stopping? Put the best stuff closest to the street so they will stop. That’s curb appeal! Remember, if your stuff looks well cared for, you’ll have less haggling and more quick sales. Make sure you price everything. Color coding tags, price tags and more are readily available at stores all over. People don’t want to guess or ask – they want to know where to start and be reasonable! We found two great checklists on the web for making sure you get everything done right. First, this downloadable PDF is a great list to print and check off as you go. Second, this LINK has a thorough checklist of Yard Sale best practices. Final Step – REWARD YOURSELF! When you are done, and have cleaned up and your life is back to normal……enjoy the fruits of your labor. If you were raising money for charity, a vacation, something new for the home or just doing some spring cleaning, you deserve to enjoy the rest of your day. Take a nap, go for a run, get a good dinner, watch a movie – after you’ve been through the process, you deserve a reward!